Come and join us on Saturday August 25, running or walking the beautiful trails of Crippen Park on Bowen Island! Our 8th annual run/walk is a great way to start Bowfest, Bowen's all-day annual festival, so prepare for a full day of fun! Online registration starts on June 15, available until 5:00pm, August 24. Registration forms also available at First Credit Union and Phoenix on Bowen. Pick up your bibs on Friday afternoon 4:00 pm to 7:00 pm on the Library lawn and avoid the Saturday morning rush! $10 for 9s and under, $20 for everyone else, $25 race day registration. 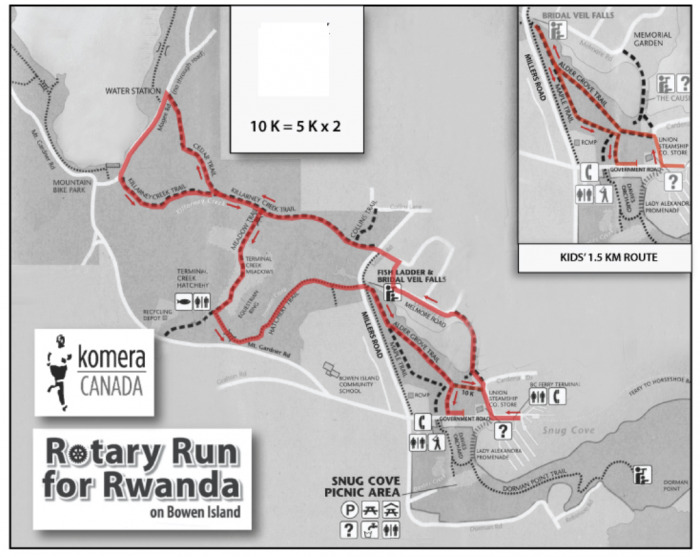 Your registration fee (and your donation) goes directly to Komera Canada, a registered Canadian charity that supports girls at high school and university in Rwanda; so please bring your family and friends to join us for the run/walk on August 25th and then enjoy Bowfest!